The following chart shows that 14.3% of Americans are now on food stamps, a total tally of 44.1 million people, a new record. These people receive a card that turns on at midnight the first day of the month. Their only concern from that point forward is that the cost of food does not rise enough that they starve. 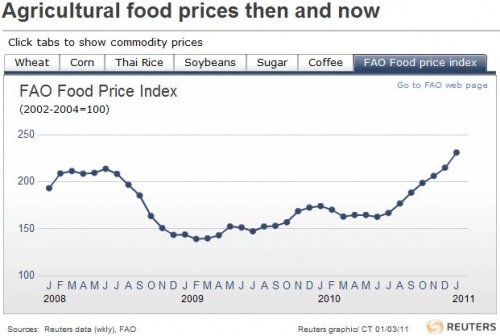 The following chart shows the U.N. Food and Agriculture price index, which has hit a new record high for the second month in a row. 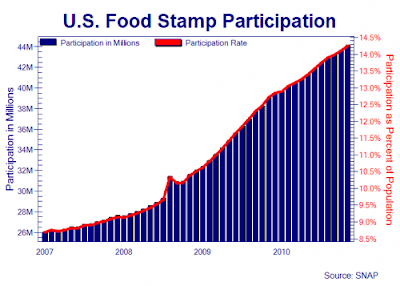 Once the cost of food rises above the ability to pay with food stamp cards, America becomes a far more dangerous place to live.